We are going to be headed back to school in just over 4 weeks. 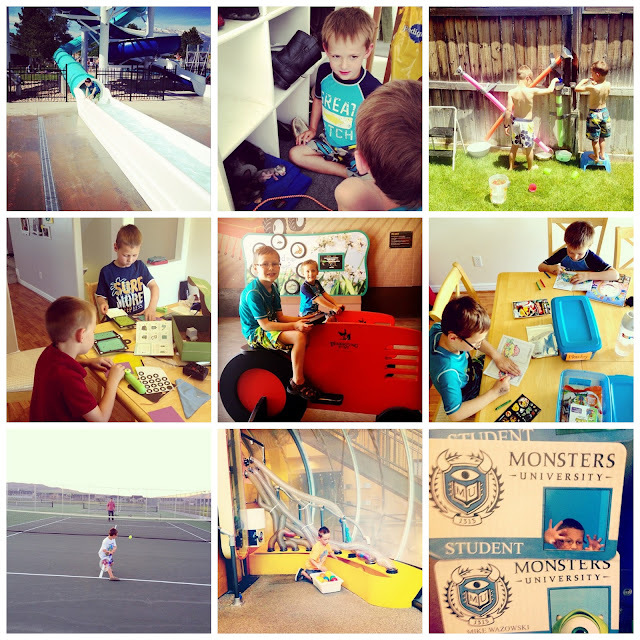 I can't believe the summer has gone by so quickly, but in a way, I'm ready for the boys to go back to school. I think they are both excited as well. We've stayed very busy this summer and have been out and about doing a lot. Crafting: We've done all sorts of coloring, crafts and even made a water wall on our fence one day. I made quiet boxes for the boys for each day of the week and replenish them on a regular basis. They really look forward to the ones that have crafts in them. Thanksgiving Point: We have a membership to Thanksgiving Point and have been there countless times this summer. We've spent a lot of time at Farm Country and The Children's Gardens in particular. Movies: We've done some of the summer movie series at the local Cinemark. We've also gone to see Monsters University and Despicable Me 2, both of which were really great films. Discovery Gateway: I also bought a 3 person pass up to Discovery Gateway Children's Museum in Salt Lake. We've been a couple of times so it's already paid for itself. While we are up there, we go play in the fountains at the Olympic Plaza. Tennis Courts: We go to the tennis courts sometimes in the evenings. The boys take their bikes and Marshall practices hitting with Chandler. Chan has a pretty goo swing on him! Friends: We've also gotten together with friends for playdates and have had fun with our blowup slides in the yard. We have 2 family reunions and a few more weeks of playing before we head back to school. It's definitely been a fun summer so far! It looks like such a fun summer! I am floored that school is so close too, I swear we JUST got out. You look wonderful, and I can't wait to see pictures of sweet Nova when she comes! You're such a great mom! What a fun summer for your boys.